Bring yourself, your pets and we’ll do the rest! All of our exciting birthday parties feature an interactive live animal show! 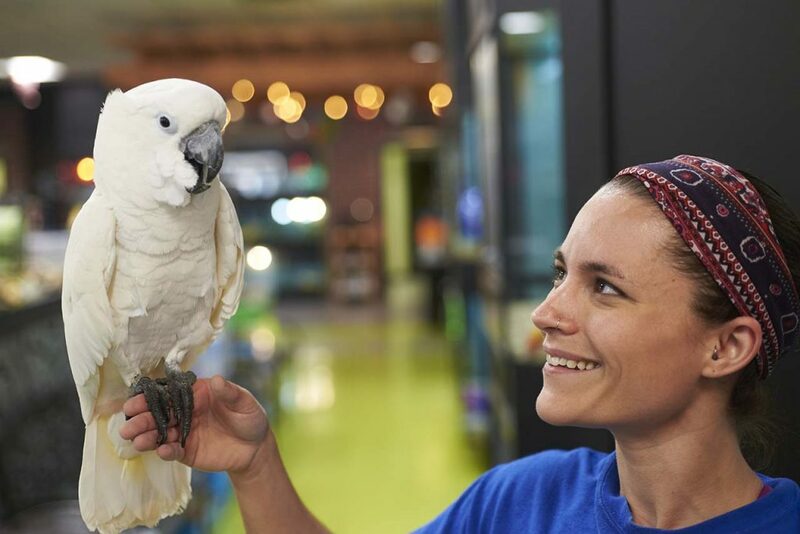 Friendly Pets in Exeter is a terrific place to host your special event. Our party experience is designed so your special guest of honor and their guests will have the best birthday experience possible. All of our exciting birthday parties feature an interactive live animal show, with animals of all shapes and sizes from across the globe. All of our party packages include small touches to make the day extraordinary – concierge greeting of all guests, private party planner, cake cutting, special guest’s name featured in store, photo assistance for the family during birthday cake presentation. Our Party room will be decorated to your specifications! 2 hour private party room for up to 12 children. Includes set-up & clean-up, exclusive FLP thank you notes, beverages, 8 inch cake from On The Vine Market Place, a catered food package from On The Vine Market Place, decorated party room, each child receives a betta fish of their choosing a Betta kit favor with all the extras and a balloon per guest. 2 hour private party room for up to 12 children. Includes set-up & clean-up, exclusive FLP thank you notes ,beverages, 8 inch cake from On The Vine Market Place, a catered food package from On The Vine Market Place, party favor bags, decorated party room and a balloon per guest. 2 hour private party room for up to 12 children. Dedicated party planner, Includes set-up & clean-up, thank you notes, beverages, balloon per guest, party favor bags , decorated party room, 8 inch cake from On The Vine Market Place and 3 cheese pizzas. Birthday Packages are available Saturday and Sundays 11:30-1:30 & 3:30-5:30. Please call or fill out the form below for availability. 50% non-refundable deposit required at the time reservation is made. Due to the nature of our FLP Birthday Party, Guests will be limited to a total of 12 children. If you would like a larger party please add $20 per child up to a total of 18 children per party.